There is one thing that we’re used to in South Africa – space. From the vast open areas of the Karoo and Northern Cape, to the expanse of the Drakensberg Mountains and, further north, the territories towards our neighboring countries. We’ve taken that love affair with open spaces into our homes. It’s commonplace for properties in our market to have large bedrooms with expansive built-in cupboards, kitchens with separate laundry areas, double garages with loads of storage space, and bathrooms large enough to chase your partner around in. I’ve recently returned from vacation in Europe where I rented apartments in both Paris and Milan. The first thing that struck me was how small and compressed everything is. Admittedly, it takes some adjustment. But after a few days you start to realize how much can be accommodated in small spaces with the right planning. In our apartments, which measured approximately 40 square meters, the architect had managed to include an entrance hall, an incredible galley kitchen which was open plan to a lounge and dining area, a guest toilet, and a main bedroom with full en-suite bathroom. Granted, the rooms were smaller than we are used to at home. But everything fitted. Take, for example, the kitchen. 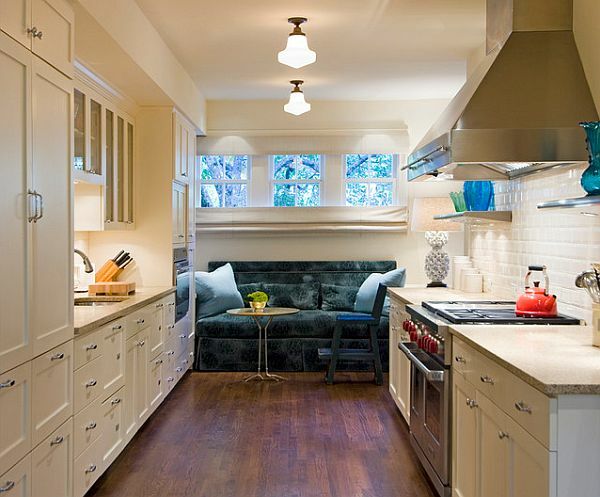 It was galley-style – so it maximized the space available and worked really nicely with the dining and lounge areas. The kitchen had everything from fridge, to oven and hob, microwave, good workspace – and even a “laundry cupboard” that housed a combined washing machine / dryer. There was also a dishwasher, built-in ironing board, and every “mod-con” you could want. The reason for this impressive use of space is simply Price. Property in European cities is horrendously. So every square meter needs to be used whilst still meeting the requirements of the resident. We were privileged to enjoy a meal in one of Paris’ Top 10 restaurants. I was expecting large dining areas with sumptuously decorated tables and waiters running back and forth. I was wrong! 10 tables with a total capacity of 24 guests greeted us as we entered. The restaurant wasn’t even the size of a double garage – but it was quaintly done. One waiter served everyone, and even though he was busy, the service was impeccable. The kitchen was open-plan to the dining room. It was also galley-style, and no more than 5 meters long by 1 meter wide. Three amazing chefs delivered food fit for a king – from 5 square meters. Amazing. And they didn’t even get in each other’s way. As the cost of property escalates, and building costs increase, I can see that South African’s will need to get used to smaller spaces. Architects will be ensuring every square meter is wisely used, thus delivering on the consumers needs, but at lower costs. It’s purely economics. It’s coming – and, when properly done, it’s a pleasure to live in. Previous Post Sole Mandates – Do I Really Need One?